The BMW Heritage models are very popular for their classic design, modern technology and sophisticated craftsmanship. While the new RnineT reflects the boutique manufacturing character, the RnineT Urban G/S is similar to the classic R80 G/S of 1980. Both models feature the potent, air/oil-cooled boxer engine with a capacity of 1 170 cc and an output of 81 kW (110 hp) combined with a 6-speed gearbox and are constructed to meet the requirements of the EU4 pollutant class. The most typical characteristic of the RnineT models is the unlimited scope of creativity for individual customizing which is of course possible as well for the new RnineT models. The frame of the new RnineT model is composed of four parts: a front main frame, a rear main frame, a removable end piece and a detachable passenger frame. When it comes to the RnineT Urban G/S, the frame comprises three components: a front main frame and rear main frame with integrated end piece and a passenger frame. 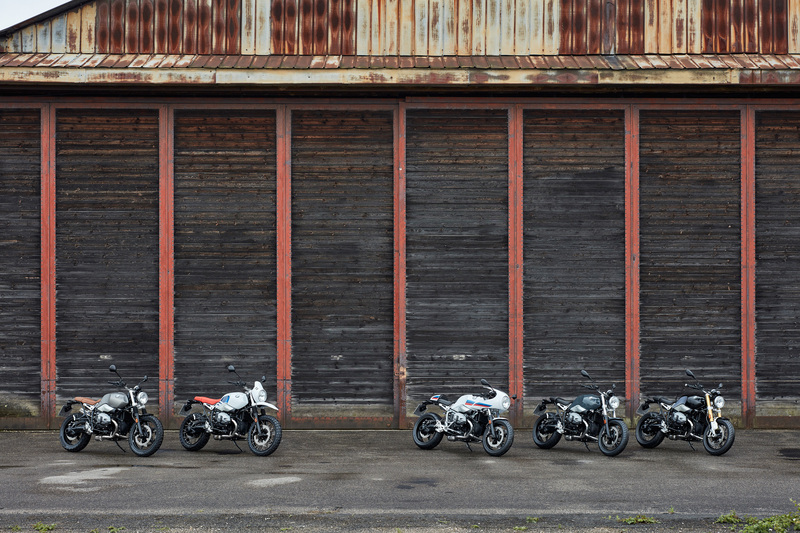 The new edition of the RnineT again features the laid-back elegance and proportions of a classic BMW Roadster. The combination of classic and modern spirit once more characterizes the puristic Roadster. 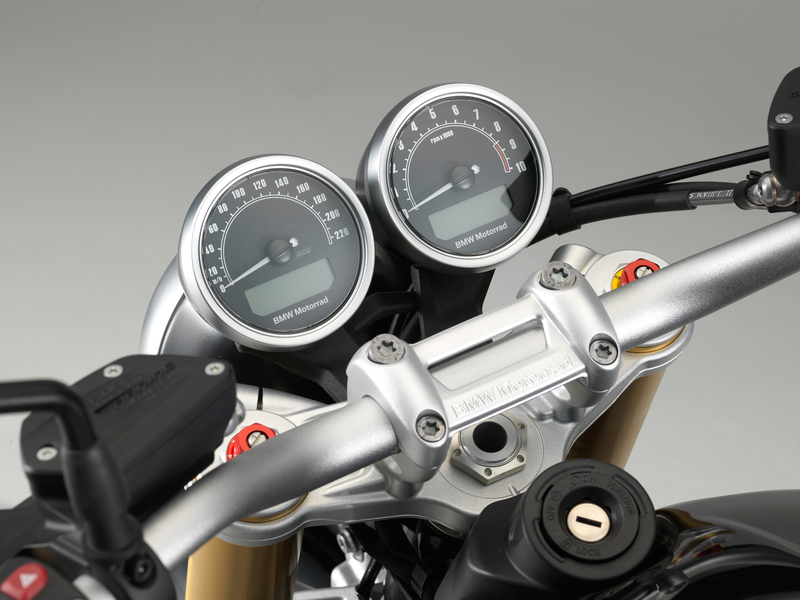 The RnineT has two separate instrument casings for an even more impressive appearance. The boutique manufacturing character rests unchanged, but with small details like the the 18-litre aluminium fuel tank with elaborately brushed side surfaces, the aluminium trim panel featuring an embossed RnineT inscription which runs across the air intake duct on the right-hand side and much more besides, the new RnineT looks even better. So far, the RnineT with its design in Blackstorm metallic combined with silver and metallic contrasts was very successful. 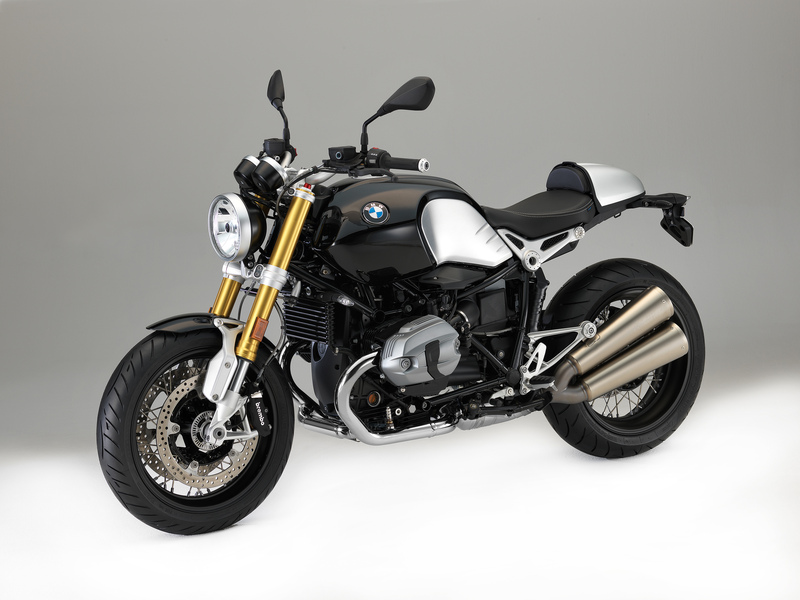 However, BMW put the final touch to the new RnineT by varnishing the Paralever swinging arm and the housing of the rear-wheel drive in black colour. In order to improve the customizing possibilities, the driver can now optionally decide between two different paintings. The first one is the special paint finish "Blackstorm metallic / Vintage" with the aluminium fuel tank in Blackstorm metallic / silver and a yellow application bearing the start number "21", which is applied by hand. In addition to that you get an aluminium hump seat and passenger pad as extra equipment. The other version is "Blueplanet metallic / Aluminium" which is based on the classic clear-finished aluminium fuel tank with ground weld seam and aluminium hump seat (both hand-brushed). The centre section of the fuel tank and hump are finished in Blueplanet metallic with a golden surround. The front mudguard is also designed in the colour Blueplanet metallic. Regardless of the manner of driving (whether off-road or on-road) the RnineT Urban G/S is the perfect companion for adventurous drivers. In contrast to the new RnineT, this motorcycle is based on the typical classic Enduro style. This is especially perceivable through the light alloy cast wheels with 19-inch front wheel in enduro style and the 17-inch rear wheel, the dual-section front mudguard and the typical front splash guard. 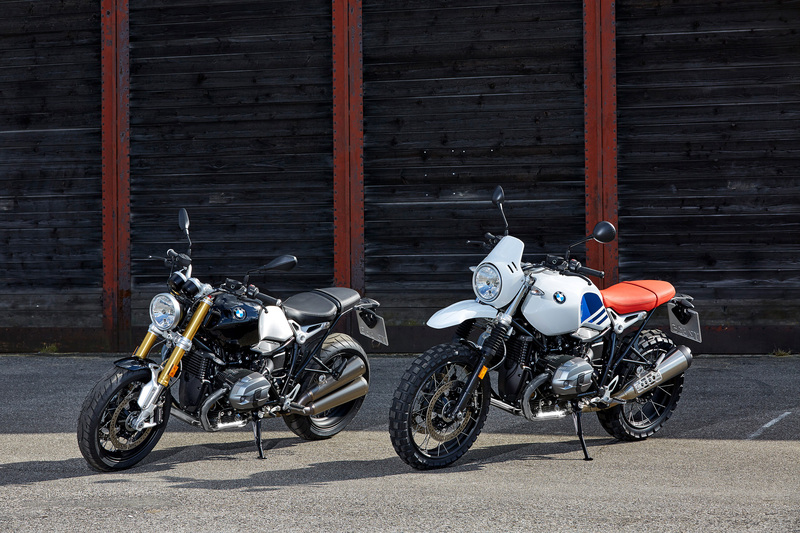 The new RnineT Urban G/S models are also available with the optional extra of deep-treaded off-road tyres which further enhance its classic style (standard trim: road tyres) and also with filigree wired-spoke wheels. It has 4-piston brake calipers, a brake disc diameter of 320 millimetres, a high-performance ABS brake system and steel-wrapped brake lines. In order to prevent the rear wheel from spinning on slippery roads, you can optionally purchase the ASC (Automatic Stability Control). At the front there is a conventional telescopic fork and at the rear BMW installed a central spring strut like as in the RnineT. 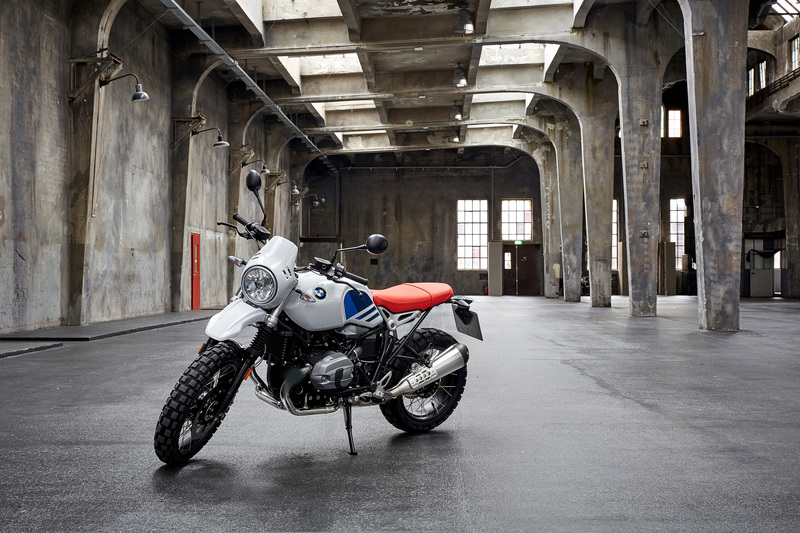 For thr RnineT Urban G/S high-end details also play a major role, like for example the numerous aluminium forged parts like fork bridges, the clamp for the aluminium double-butted tubular handlebars and much more besides. When it comes to the design of the new model, BMW has decided to lacquer the motorcycle just like 35 years ago. 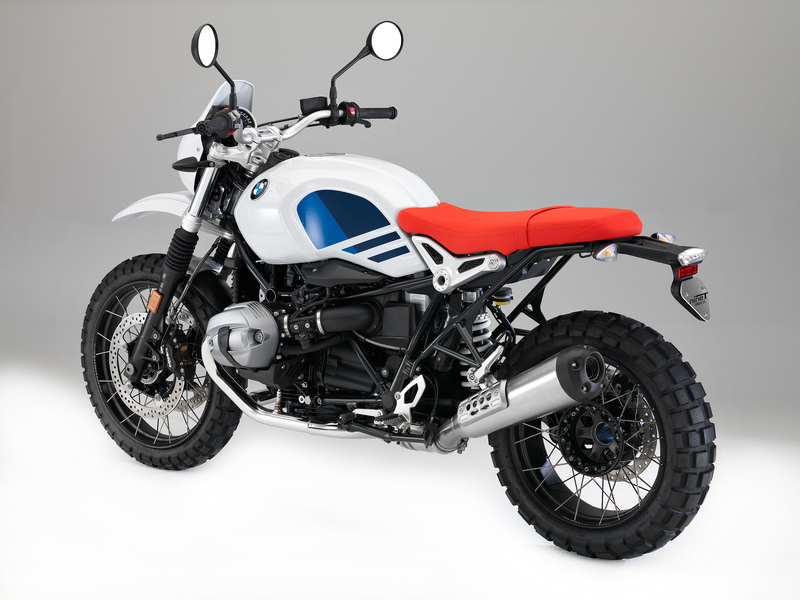 The fuel tank and the high-positioned front mudguard are finished in striking Lightwhite non-metallic, the fuel tank decor features two tones of blue and the two-man seat shines in bright red. Here you can find all Hornig accessory products for your BMW RnineT and RnineT Urban G/S.